Start with a visit to New England and 0-6-0 # 7470 at the Conway Scenic Railroad during fall colors. This railroad features a historic depot, roundhouse, and pleasant countryside. Next we head to Frankfort, Indiana and see two roundtrips with Nickel Plate Road 2-8-2 # 587 from Frankfort to Muncie, Indiana. We then visit the cab of Norfolk and Western 2-6-6-4 # 1218 and get a tour of the interior from the engineer and fireman who explain the controls in the cab between excursion runs. Our last segment in Volume One is Norfolk and Western 4-8-4 # 611 on a trip from Cincinnati to Portsmouth in 1990. The engine stalls on Peebles hill and has to have the rails sanded by hand to inch its way to the summit, an incredibly rare sight on mainline rails. Volume Two takes us to New Brunswick, Canada and the Salem & Hillsborough Railroad. First wee see ex CN 4-6-0 # 1009 on several trips, both passenger and special freight trains arranged for our cameras. Then we enjoy rare scenes of ancient 4-4-0 # 29 in action on passenger trains. This video, shot in 1989, was the very last steam action for 29 as it later burned in a 1995 shop fire and is now on display in front of the CPR headquarters in Calgary. The next segment is a baseball special from St. Albans, WV to Cincinnati, Ohio with Nickel Plate 2-8-4 # 765 with some nice mainline running and a neat arrival view from atop Cincinnati Union Terminal. The last segment is a winter Santa Claus train with Kentucky Central 2-6-2 # 11 from Paris to Maysville, Kentucky in 1990. Nice sunshine and a Christmas wreath adorn the front of #11 while Santa waves to all from the rear platform of this festive steam special. 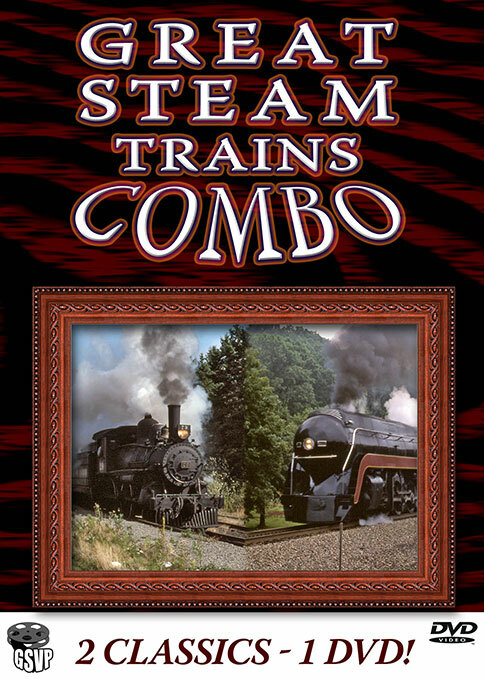 This is great steam action that can never be repeated as most of these do not run today. Menu feature allows segments to be selected. Live steam audio with minimal narration. chris collins (fletcher north carolina) on 2018-07-23 19:31:25. Andrew DeSabatino (Huntingdon Valley, Pennsylvania) on 2011-06-07 16:27:30. This is a great show. Lots of steam trains in the U.S and Canada. From trackside to cab views and locomotives going up hills, it's all here! Steamboy (Revere MA US) on 2016-11-29 07:30:12. This combo from the 2006-2007 season features volumes 1 & 2 from 1994, with footages shot from 1987-1991(The JVC era). First in part 1, there's June 1991 action of NKP 587 on an excursion from Frankfort to Munchie, IN. Next there's late September or early to mid October 1989 footage on the Conway scenic railroad with CN 7470(I was shocked that Greg was there before I exist. ), plus a cab tour of N&W 1218 in 1987, and 611 on the stall at peebles hill in 1990. In part 2, there is September 1989 action on the now gone Salem & Hillsbourogh railroad which is now the New Brunswick Railway museum. First there's CN 1009 on a passenger train, plus CP 4-4-0 29 before it was burned in flames years later, now outside CP HQ. As well as 1009 on a special freight. There is also September 1, 1991 action with NKP 765 built in 1944 on a baseball special from St. Albans WV to Cincinatti, a couple weeks after the NRHS convention in Huntington. Finally in December 1990, there is a TTI Christmas train with Reader Railroad 2-6-2 11. The only locomotive in operation today? 611.